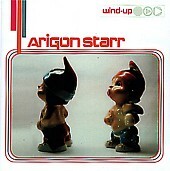 Rock, Pop, Country & Folk singer/guitarist Arigon Starr recently released her second CD "Wind Up". Arigon Starr is a high profile musician/activist on the Native American scene, capturing the Best Independent Recording Award at last years Native American Music Awards with her debut CD "Meet The Diva". An enrolled member of the Kickapoo Tribe of Oklahoma, Arigon Starr is busy touring, writing material for her next CD project (which is scheduled for release late in 2001) and working on several other projects, including writing a graphic comic novel. Sonya: What is the current Arigon Starr line-up? Arigon: Right now, we're going out as a semi-acoustic trio, myself on acoustic guitar and lead vocals, Nicholas Peters on drums & vocals and my sister Gay Wahpecome on backing vocals, flute & percussion. We're in the process of adding another person to the line-up. Arigon: I'm basically a self-taught musician. I did have formal training on piano and many voice lessons, but the songwriting I was able to figure out on my own. My parents had a wide range of music tastes, and I grew up listening to everything from classical music and jazz to show tunes and country & western swing. When I heard the Beatles music, that's when my life changed. I saw four people come from nowhere and take over the world with this amazing music....and I thought "I could do that!" I began writing songs as a teen and just kept going with it. Over the years, I played bass and guitar in lots of amateur bands, while writing songs on the side. When I decided to relocate from San Diego to Los Angeles, I took my acoustic guitar and starting singing in coffeehouses. It was a terrific way to hone my craft and develop a rapport with audiences. After trying to out-sing the cappuccino machine one too many times, I decided to add some volume to the act. I found some great musicians in San Diego and put together and band -- and then my debut CD, MEET THE DIVA. Arigon: I am a Native American. An enrolled member of the Kickapoo Tribe of Oklahoma. My mother is an enrolled member of the Creek Nation of Oklahoma. As a American Indian woman... I can't help but be political or an activist. I am very concerned about where the Red Race is headed and how we're going to get there. We have many pressing issues facing us everyday -- from loss of tribal sovereignty, land, fishing rights -- you name it! It is very difficult to concisely convey to people what it's like to be an Indian in contemporary society. Either we're dripping with money from Casinos or we're drunk on the reservation, living on welfare. There is no middle ground, although I know plenty of Indian people who hold down jobs, raise families and own their own homes without the benefit of Casino money or government hand-outs. It's a challenge everyday to take on these stereotypes which have infiltrated every part of society -- especially the music industry. One of the greatest causes I like to support is empowering our Indian youth. I've had the opportunity to speak to a lot of kids, on and off the reservation about pursuing their dreams and living their lives to the full. There's a lot of talent and energy out there that I hope to nurture by being a force on the scene. I hope to show them that it is possible to make a difference and be successful. Sonya: What can you tell readers about the Native American Music Awards? 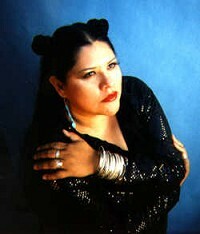 Arigon: The Native American Music Awards began back in 1998, started by a woman named Ellen Bello in New York City. She had worked in various aspects of the music industry and with Native clients and saw a need to recognize the talents of the people. The event started small and has grown larger every year. The awards honor traditional and contemporary music, plus recognize the achievements of Native people in society and sports. The first year, they honored Jimi Hendrix, who's of Cherokee descent, the following year Hank Williams, who was Creek/Cherokee. I was honored to be nominated for four awards at the Third Annual Awards program and was named the winner for the Best Independent Recording. My band played at the awards show, along with such artists as Hank Williams III and The Lynns. We got a lot of attention and positive feedback that night from folks like John Densmore, Jennifer Warnes and Rita Coolidge. NAMA (Native American Music Association) was also a major force behind NARAS adding a Native music category to this year's Grammy Awards. It may seem strange that with all of the categories Grammy does have, they have NEVER honored Native American music as a distinct genre. The Fourth Annual Native American Music Awards will take place on June 16, 2001 at the Soaring Eagle Casino in Michigan. We are really hoping to capture more nominations for "Wind-Up" at the next awards show! Sonya: Wind Up definitely has a "theme"! If you could get one message across through your music, what would that message be? Arigon: I want people to know that Native American people are here today in contemporary society. We don't all live in teepees, do sweatlodges, live on reservations or own casinos. We are your neighbors, your friends and...well, your original landlord! wink! 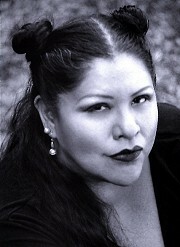 Sonya: The track "Honor Me" (Wind Up) is about sports teams who use Native American terms in their organizations. This track really makes a strong statement! What insight can you give readers regarding this track. Arigon: We have to remind everyone that we are PEOPLE first, not mascots. I can't imagine anyone taking imagery from Catholicism and naming their team "The Seattle Saviors." If a sports team decided to become the St. Louis Sambos, there would be a huge outcry. History books have reduced the Red Race to dust and have firmly put us in the past. This is not a case of being "politically correct", which is one of the major complaints I've heard from those who support Indian mascots. I get sick to my stomach every time I see Atlanta fans doing the "Tomahawk Chop" or seeing the Cleveland "grinning Indian." I personally don't own a tomahawk, or sport a big, old plastered smile. These images demoralize us and make us less than human to the general public. The sooner we're rid of these stereotypes the better. No other race of people would feel honored by these mascots. Think about it! Sonya: Recently, Indie filmmakers have taken an interest in your music (Valerie Red-Horse and Carol Brook whose films premiered at the Sundance Film Festival). What future plans do you have to incorporate your music into film? Arigon: I'm working on a super-secret project with a very famous person from a very popular band. Could I be more obtuse? Honestly, yes, there are more things on the schedule for my music and film. I'm also a writer, and hope to be able to write my own film project and do the music. It will happen, but it's going to take some time! Sonya: On your cd "Meet the Diva", you have a song called "Eugene Tooms is Dead". Why did you decide to include this reference to the X-Files in your music? Arigon: First of all, I do enjoy the show. The idea for the song actually came from a friend of mine who said, "I challenge you to come up with a song that has the line 'He creeped me out' in it." I took her very seriously because I love a challenge! If you listen to the last verse, that's were that line fits in. Had to find someone creepy to write about! On a side note, another friend of mine was David Duchovny's personal driver on a season of the show. He gleefully put on my CD while driving him around -- and I have to tell you, the song made David Duchovny smile! Sonya: The track "Agent 49" from your cd "Wind Up" has a bit of "B-52s" sound to it. This seems to be a fun track for you. What do you consider your most lighthearted tracks (and why)? Arigon: "Agent 49" is an actual, real person. I wrote the song about him because I love his spirit of fun and duty. It isn't easy to be in law enforcement and Native American, you take flack from both sides! Also, I have always adored the B-52s, their quirky arrangements and harmonies sent me over the top! I think the most light-hearted track on "Wind-Up" is "Junior Frybread." Again, sort of a real person -- one who searches every pow-wow for the perfect frybread. There's also a tribute to my favorite character on "Buffy The Vampire Slayer," -- Spike! He rocks! There are a lot of different aspects to being a contemporary Native woman. Having fun is definitely a BIG part of it! Sonya: What do you consider your most serious tracks (and why)? Arigon: Probably the most intense one is the tribute song to Leonard Peltier, a Native man who was wrongly convicted and imprisoned for a crime he didn't commit. He has become our own "Nelson Mandela". Mr. Peltier has been in prison over 24 years, yet there is a glimmer of hope he'll receive Executive Clemency from President Clinton. I'm not the only person who's sung about him, I believe Rage Against The Machine recently had a song about him, too. Amnesty International and a host of world leaders have also called for Peltier's release. I am also really proud of the track "Indian Land Forever," which sings about the 19 month occupation of Alcatraz Island back in the early 1970's. This action of Indians from all nations jumpstarted a political movement which is still going on today. I especially like talking about this incident with kids -- many of them are not even aware of their own recent history! Sonya: Several of your tracks contain Native American terms. What does "Snagging" mean (from the track "Snagging" on the cd "Wind Up")? Arigon: This is one of my favorite "fun" tracks because it speaks directly to my Indian audience. "Snagging" refers to getting up close and personal with the partner of your choice. Some people say it's like "dating," but often it's just a one-night deal! Many of we ladies have the goal of getting our male "Snag" for the night. It's all in fun, really -- nothing too serious here! Sonya: I read that you opened for the Foo Fighters. Please share that experience with our readers! Arigon: Oh, how I wish this were true! The gentleman who wrote the piece in Billboard Magazine about us got a comment in our pitch letter mixed up with the facts. I was attempting to illustrate the diverse audience I have, because I have played to everyone from grandmas to gangbangers with very positive results. There's nothing like seeing a 75-year old Navajo grandma head-banging right next to a skateboard kid at one of my shows. Sonya: What are your current tour plans? Arigon: We are planning on targeting the east coast and Great Lakes area next year. We'll also continue to entertain our fans here in Southern California with one-offs here and there. We do good business at Borders Books & Music, that's for sure! We also hope to do more shows in the Southwest, too. Sonya: What does the future hold for Arigon Starr?! Arigon: I'd love to see my music available in every Wal-Mart, Sam Goody, Tower Records and independent mom & pop store across the country. I know we are eventually going to branch out to the European Market....which really digs the Indian scene. It's funny we seem to get more respect over there than here in the States. Maybe I'll move to London and get everyone stirred up like Hendrix did! In the meantime, I'm continuing to write material for my next CD project, which I plan to release late in 2001. I'm also working on several writing projects, and will have a graphic comic novel sometime in the future. My other love is cartoons/comics -- so you'll most likely see something Native themed from me in that area. One of the best things I've seen written about me lately was from another website, called Indianz.com. They suggested that I run for President! I know that I'll continue to be politically active and working with Indian issues on a grassroots level. There is so much work to be done, I can't see how I'll ever be bored! Believe me, this won't be the last time you hear my name.